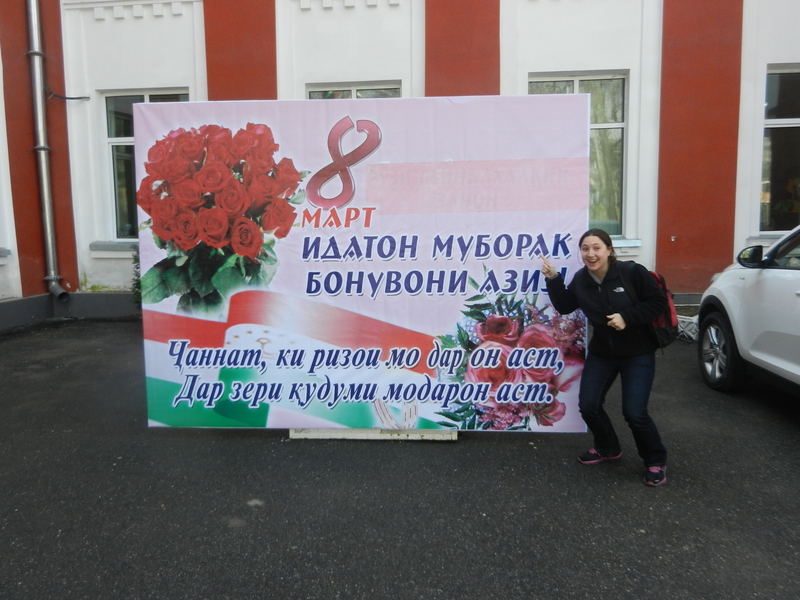 This post was going to be all about International Women’s Day in Tajikistan. Then Sunday got wacky. It started with an innocent decision. We decided to go bowling. There are two bowling alleys in Dushanbe. We decided to go to the cheaper one, because we are college students. I grew up in Erie, Pennsylvania, so I’ve spent my fair share of time in bowling alleys. But never quite like this. As we grumbled about the lack of bowling shoes and kinda weird atmosphere, we noticed that next to us were some guys with film cameras. We hoped that we weren’t in their film. But then they approached us. They spoke English. They asked us to be in a commercial. For pain cream. It was called “BolNol” which according to my friend Joey means “Zero Pain” in Russian. And we had to pretend to bowl, and at one point I had to pretend to apply the cream, and we did these shots over and over and over again. It took quite a long time. But, next time you’re watching TV in Tajikistan, Uzbekistan or Turkmenistan, watch out for me, bowling badly and cheering and showing off some BolNol! We got some free juice from the bowling alley as payment. International Women’s Day is a big deal over here. Its much bigger than National Men’s Day, which was about 2 weeks ago and mostly passed unnoticed (cough *snarky comment about how every day is men’s day* cough). 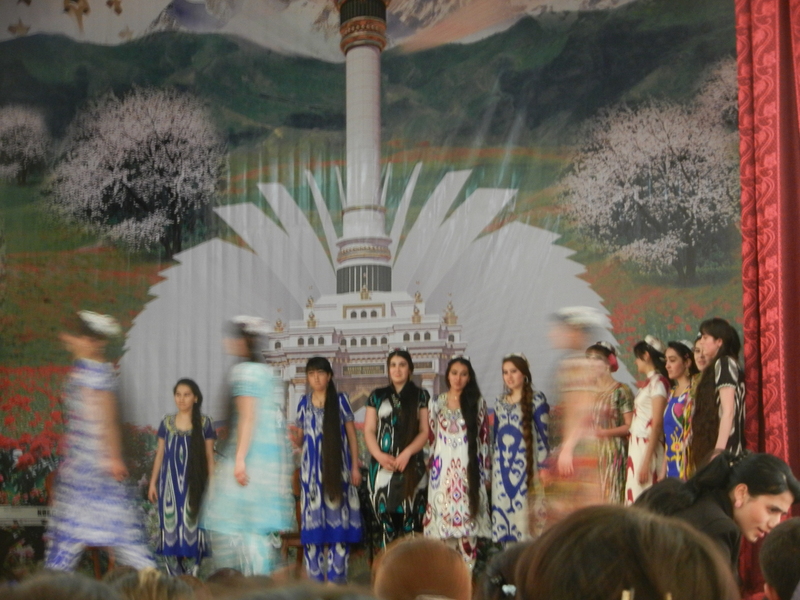 Anyway, International Women’s Day (Thursday 8 March) is an official holiday in Tajikistan- schools, offices, etc. all close. I think there is sort of the feeling that men should do things for women on International Women’s Day. But mostly this is just buying flowers. Because, at least in my host family, no one would ever let a man bake a cake. Sign outside the National University. It says "8 March: Happy Eid to dear ladies." I started my Women’s Day celebrations on Wednesday. My friends and I went to an exhibition at the National University. Foolishly, we assumed that because it was advertised as starting at noon, it would start at noon. Silly us! This is Tajikistan! It started at 1pm, and we had to leave rather quickly to get back to class. We did get to hear a rousing rendition of the National Anthem, and then an old man read a list of the number of women in each faculty at the University. It was fascinating. On actual Women’s Day itself, my host family presented me with gifts over breakfast. I got a Traditional Tajik Hat and a figurine of two doves. And a kiwi! I was pretty psyched about the hat, because I can wear it on Nowruz (Persian New Year), which is coming up. In the evening, my host family and I went to my host grandmother’s house. We had a lot of cake, because not only was it International Women’s Day, but it was also my host brother’s 10th birthday. Lucky kid! What ten year old boy doesn’t want to share the limelight with International Women’s Day? I got him a Pokemon/ Ben 10 DVD, and I got my host mom flowers. International Women’s Day got me thinking. No, not about gender inequality (ok, it did, but I don’t feel like blogging about it). About how I now possessed a Traditional Tajik Hat, but no Traditional Tajik Outfit. What to do?! Obviously a trip out to the giant bazaar on the edge of town was in order. I managed to get a decent price on some material, and this week will take it to a seamstress to have my kurta (dress-like top… much longer and more flowy than its Indian counterpart) and salvar (aka cozy pajama pants) sewn. As we left the bazaar, I convinced my friend Joey that taking a bus back to town was a viable means of transport. 20 cents, 7 kilometers and one hour later, we arrived back in Central Dushanbe, a little worse for wear. Thou art not a donkey upon which men ride. This entry was posted in Uncategorized and tagged 10th birthday, Advertisements, bolnol, bowling, hats, International Women's Day, IWD, kurta, pain cream, Persian, Poetry, Saadi, Tajiki, Tajikistan, traditional clothing, weird things that only happen in Tajik bowling alleys. ← The third largest aluminum factory in the world!!!! !